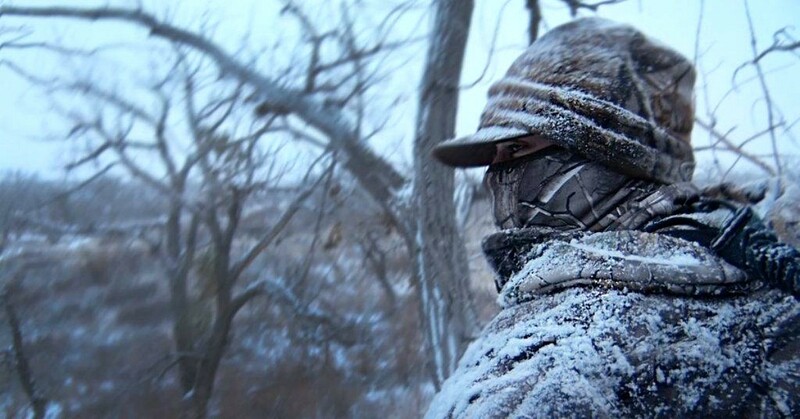 A veteran Minnesota bowhunter shares cold-weather gear advice for how to stay warm on stand, regardless of temperature. Fact: When the temperature plummets below freezing and north winds begin ripping through the treetops, it’s very difficult to stay warm on stand for more than a few hours. I own the latest and greatest cold-weather jackets and bibs, and no matter how many layers I wear under these insulated outer garments, my maximum time on stand is 3 hours when the wind chill — actual felt temperature — is zero or below. Click here to see a chart for calculating wind chill. Sure, I can “tough it out” as my dad would say and make it another hour, but if a mature buck steps into my shooting lane, my chance of making an accurate bow shot isn’t good. Why? I’ll be shaking uncontrollably, not from buck fever but because I’m freezing. Also, because I’m dressed like the Michelin Man, it’s almost impossible to find the correct anchor point and then execute a well-placed shot without the bow string crashing into my bulky jacket upon release. Thankfully, I’ve found a better system for beating the cold. When it comes to surviving brutally cold temps in the stand, function is more important than fashion. Anyone who lives in the North understands the difference between a glove and a mitten. A glove separates each finger, while a mitten keeps all your fingers together. For this reason, an insulated mitten is always warmer than an insulated glove. This simple concept is the basis behind the Heater Body Suit. True story: I recently spent an entire hunting day in a hang-on treestand in South Dakota. I climbed into the stand at 6:30 a.m., and climbed down 30 minutes after sunset, at 5:30 p.m. My feet didn't touch the forest floor for 11 hours. The air temp was 5 degrees at sunrise. Combine the unseasonably cold air temps for early November with 20-mph northwest winds, and the wind chill was minus 15 degrees to start my day. At no point during the day did the wind chill climb above zero. I was able to stay on stand the entire hunting day because I immediately climbed into my Heater Body Suit at 6:30 a.m. Throughout the day I’d occasionally rise to a standing position to stretch. No, I didn’t kill a deer that day, but my chances of success were maximized because I comfortable and in the woods. I wasn’t hiking back to the truck to get warm; I wasn’t driving dirt roads with the pickup heater blasting on high and cursing Mother Nature. During the rut, when mature bucks can be on their feet searching for a doe-in-heat at any point of the day, it makes sense to spend as much time as possible in the stand. Period. As the photos here show, a Heater Body Suit is basically an insulated sleeping bag with legs. Before climbing into the suit, you slip your boots into the included Insulated Booties. These Booties not only keep your feet extra-warm, but they enable you to slide your boots into the bottom of the suit without snagging. Next, you stand and place the two interior shoulder straps over your head and adjust for length — not too tight, not too loose. Finally, you quietly slide the one-and-only zipper up to your chin and then sit down and wait — in cozy comfort — for a whitetail. Author selfie from the stand, showing his system for keeping his neck, face and head warm. I’ve owned a Heater Body Suit for nearly 20 years, so I’m speaking from experience when it comes to knowing what to wear under the suit. In simplest terms, you should dress as if you’re going for a long, slow walk and want to stay warm. Let me be very specific regarding my garment choices. On the 11-hour-straight frigid day I spent recently in South Dakota, I wore the following items: heavy wool socks and 2,000-gram insulated pac boots; boxer brief, lightweight long underwear bottom, heavyweight fleece long underwear bottom, insulated camo pant; t-shirt, lightweight long underwear top, heavyweight fleece long underwear top, quarter-zip fleece top, insulated camo jacket; neck gaiter, face mask, thin stocking cap, heavy wind-proof stocking cap; insulated glove on left (bow) hand, thin glove on right (release) hand. Let me do the math for you: On the bottom, I wore four layers; on the top, five layers. Keep in mind that these layers are not super thick, and they fit/layer together nicely. I avoid wearing bulky clothing inside the Heater Body Suit. Several layers is best. Of course, you should never wear cotton; instead, choose garments that wick away moisture. Don’t neglect your neck, face and head; two warm hats are better than one. I said earlier that you should dress as if you’re going for a long, slow walk. Think about it: This is exactly how you should be accessing your hunting area. You don’t want to hike fast and become sweaty on the way to your stand, otherwise you risk getting cold after you stop moving. Slow and steady is the way to go. The Heater Body Suit comes with straps for carrying like a backpack, so you’ll have your hands free to hold your bow and other gear. Don’t wear the neck gaiter, face mask and two hats during your hike; wear only as much as needed on your head to stay warm and then finish dressing after you zip into the suit. A bit of treestand safety advice: Always wear a full-body harness. Always! Slipping into the Booties of the Heater Body Suit might be a challenge depending on your flexibility, and you don’t want to take a header off the end of the treestand as you’re getting ready. You’ll need a bit of platform room to climb into a Heater Body Suit; compact hang-on stands aren’t the best choice. You don’t need a massive treestand, but try to avoid those platforms that are on the small side. A few years ago the author shot this magnum South Dakota doe in late December. Air temp was minus 19 degrees, with north winds of 20 mph. According to the modern wind chill charts, it felt like minus 47 degrees. And for those of you old enough to remember the previous wind chill chart, it felt like minus 65. Regardless of the actual number, it was cold! A Heater Body Suit kept him warm from before sunrise until the midday shot. Note: Check out the pink arrow; that's what happens with blood "flash freezes" in extreme cold. How Do You Shoot From the Suit? The reason to dress fairly warm inside the suit is you’ll have to unzip it about halfway to take a shot. The zipper is silent so it won’t alert deer, but it pays to time it right. Generally, I like to stand the moment I see a deer in the distance. I don’t unzip the suit too early. Keep in mind that it’s super cold outside — that’s why you’re wearing the suit — and the rush of cold air into your chest area will be noticeable. If the deer is one I want to shoot, I unzip the suit when the animal is still a good distance away; about 50-75 yards, depending on cover thickness and pace of the deer. My bow is hanging nearby, so I don’t have far to move to grab it. I keep the suit closed with my hands after unzipping it. As the deer approaches, I reach with my left hand for my bow (I shoot right-handed). I bring the bowstring close into my chest; the suit is unzipped but still closed for the most part. If it looks like a shot is likely, I attach my release to the D-loop; the suit is still largely closed, my hands close to my chest. As the deer walks even closer (my shot is going to come soon), I inch my left elbow out of the suit and sort of pull the suit off my left shoulder with my elbow. Assuming everything is still a go, I do the same with my right elbow. With the suit now resting on the ends of my shoulders, I’m free to draw my bow, anchor and then release without the string impacting the suit. The two interior shoulder straps keep the suit from falling around my feet as I draw; the suit slips off my shoulders but doesn’t move any further. The system is deadly. As this photo shows, a Heater Body Suit is out of the way when it's time to drop the string on a whitetail. Unlike many garments supposedly designed for cold weather, the Heater Body Suit is built with super-quiet fabric. I’ve used my suit in air temps of minus 25 and it doesn’t become stiff and noisy. It blocks the wind, repels snow and is extremely warm. You can check out the website for all the fabric specs. A note about Heater Body Suit sizing: I’m 5 feet 10 inches and weigh 175 pounds; I use a size large suit. The size chart on the company website is spot on; trust it. Owning a suit that’s too tall or wide will be cumbersome in the stand. For a limited time, the Heater Body Suit is available in Predator Fall Gray, which is an outstanding camo for snowy conditions. The Blizzard Buddy is similar to a Heater Body Suit but has a zipper for each arm. I understand that other companies make similar products to the Heater Body Suit; Blizzard Buddy is one of them. I don’t have first-hand experience with the Blizzard Buddy, so I can’t offer any insight. It looks like a high-quality suit, but the material appears to be thinner, so I’m guessing that a Heater Body Suit is warmer. Another Blizzard Buddy observation: While having two zippers to free up your arms might seem like an advantage, I’m not so sure. After you grab your bow with this system and attach your release, your hands are in the open (cold!) air while you wait for a shot. As I described previously, with the Heater Body Suit I can bring my hands and much of the bow inside my mostly closed (but unzipped) suit while waiting for my shot. The Heater Body Suit is priced at $380 (free shipping to customers in the USA); Blizzard Buddy cost is $360 (also free shipping). Neither one is inexpensive, but you can’t put a price on the ability to stay in a stand all day during frigid conditions. Think about it: you’ll spend more than that on a top-of-the-line, heavyweight, insulated parka and bib combo. And at best, you’ll be able to stay in the stand in frigid cold only 3-4 hours in a parka/bib combo vs. all day in a Heater Body Suit or similar product. For me, the choice is obvious. A Heater Body Suit works well for gun hunting, too. The author sat dark to dark in a ground blind to finally get his chance at this Saskatchewan drop-tine bruiser. Due to the cold temps, this wouldn't have been possible without a Heater Body Suit. Check out the video below to see the Heater Body Suit in action. It gives you a good idea of how the suit performs while drawing a bow. ARE YOU AIMING AT THE WRONG SPOT ON A BROADSIDE WHITETAIL?